I love the simple things you can make. Em and I were only saying last week we sometimes think they are the best ideas we have! This week I made the easiest little framed gift you could think of. Perfect for a little baby's room. I found a font I liked called Monaco, from my Microsoft Word. Then I wrote out 'ABC' in the font and then increased the screen size to 500% and traced straight off the screen onto some baking paper. 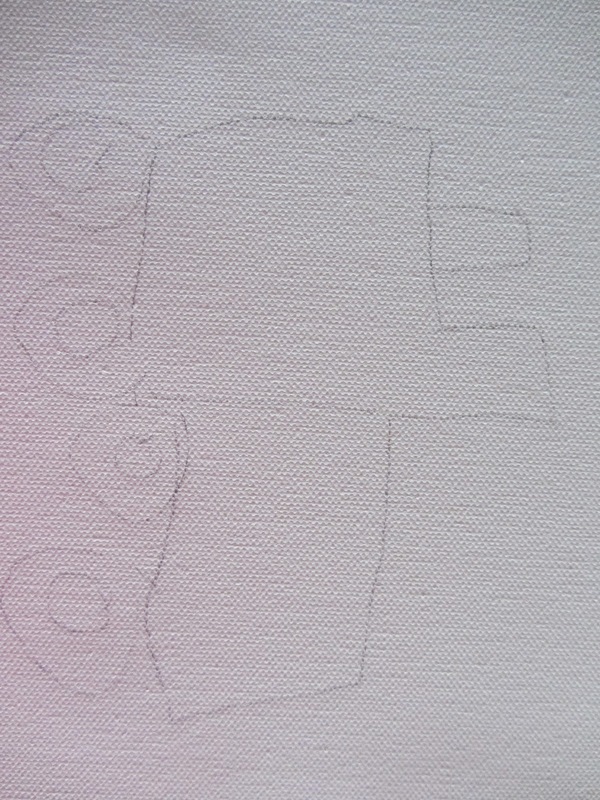 Next I cut out the paper shapes, and used them to trace around onto the back of the fabric. 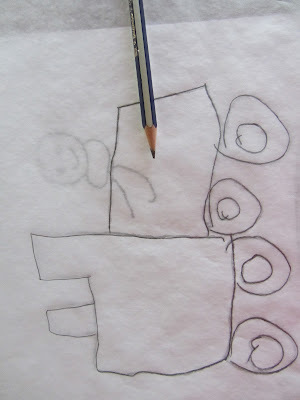 Just remember you need to trace them in the mirror image if you are tracing on the back of the fabric. Finally I cut them out and glued them to a piece of card and framed it. It was really so simple – it took me half and hour while I watched tv!! Like most of the things Em and I make there are so many variations you could make with this idea. Large bold coloured letters, lower-case letters, or giant letters in individual frames… they would all look amazing! Happy crafting this long weekend. We are going to a birthday party this morning for a little boy who’s turning 4. I wanted to give him something that was personalised, yet didn’t take me too much time to make! So I decided to make him a little tin-can pencil holder (I purchased the pencils of course!) 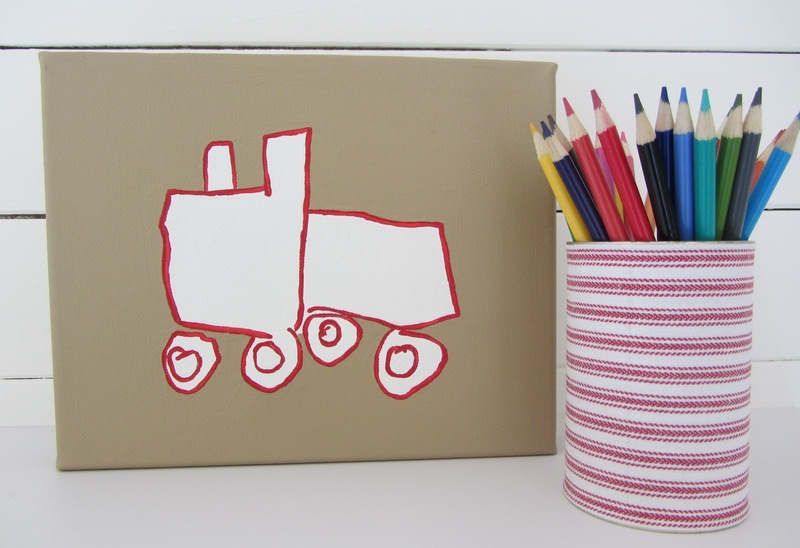 and a little train painting on canvas to give him inspirations for his future scribbling! The baked bean tin that I used for the pencil holder looks really nice and is VERY simple to do. Read here to see how to easily make the pencil holder with a bit of spray glue and material. And as we all know, children’s artwork is one of the happiest and loveliest thing in the world! Therefore I “stole” one of my daughter’s drawings and used that for the train. Firstly, I enlarged the drawing on my laser printer/photocopier. The drawing itself looked like this (below, already enlarged), and was originally quite small. It is very cutely named “Mummy driving a train”. !! I then traced the part of it that I wanted to use! (i.e. I took “Mummy” off the drawing!) Sorry about the orientation of these photos, it's blogger's fault! 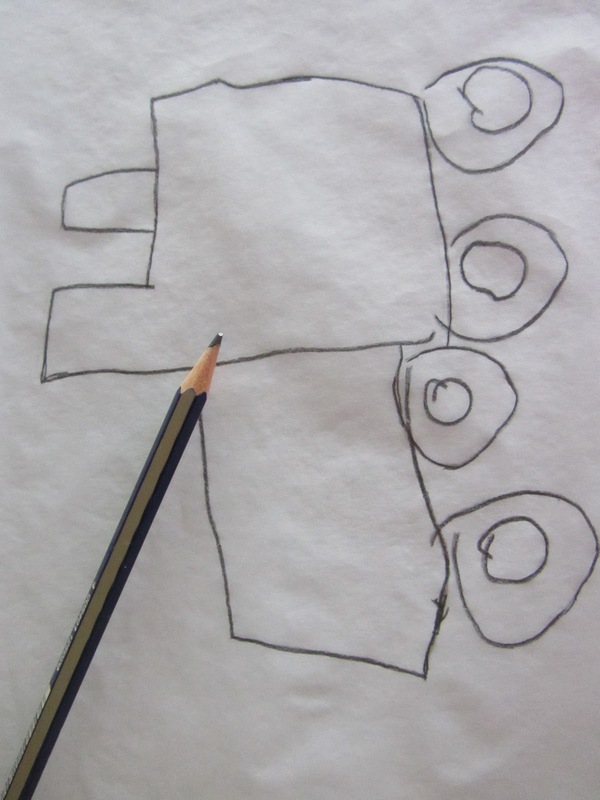 I then turned the tracing paper over and traced over the lines again. 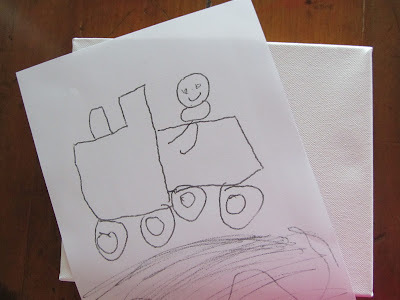 This was so that the train was facing the way I wanted it to on the canvas. 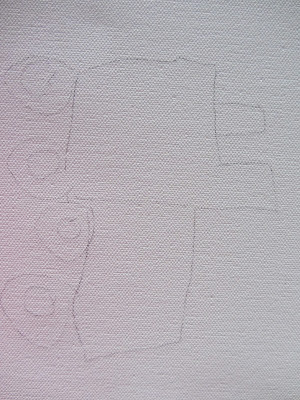 Then I simply placed it on the canvas, traced again, and then painted it. I used Dulux Eagle Feather for the brown, and Haymes Red Geranium for the red. I did paint some white in the middle using a little leftover tin of Dulux Natural White. There are absolutely ENDLESS options for this project. An arrangement of lovely little (or big!) painted drawings would just look SO good in any room… and you can just do them in the colours that you want to have in the room! I think I'm also going to do something similar on a t-shirt soon for my little boy. I’m sure our little friend will love his new presents!